Sometimes when flipping through a magazine, I’ll see a recipe and think, “I have to make that.” And sometimes, it actually happens. I spotted this recipe for Blueberry Cornmeal Pancakes in last month’s Martha Stewart Living and the next morning — a Sunday (is there a more perfect day for pancakes?) — I was up, bright and early, making stirring, pouring and flipping. It was well worth it. The blueberries burst lustfully with each bite of pancake, and the orange maple butter — a concoction so delicious you’ll be desperate to find uses for it if there are any leftovers — just makes breakfast that much better. There are two small changes I might make next time. The first is adding zest to the pancake batter itself (this is in addition to the zest in the butter). I love the bright sunshine-y flavor of orange paired with the sweet muskiness of the berries so much, I really can’t get enough. The second is eliminating orange juice from the orange maple butter. I couldn’t get both the juice and the syrup to fully emulsify into the butter so while delicious, it was a bit “weepy” and unappealing to the eye. The recipes for the pancakes and the butter appear without these changes. Whisk together flour, cornmeal, 2 tablespoons sugar, the baking powder, salt and baking soda. In another bowl, whisk together buttermilk, milk, butter and egg. Whisk wet ingredients into dry ingredients until just combined (mixture will be lumpy). Preheat oven to 200 degrees (for keeping pancakes warm). Heat a griddle or large nonstick skillet over medium heat. Toss blueberries with remaining 2 tablespoons sugar. Brush griddle with melted butter. Spoon batter onto griddle 1/3 cup at a time. 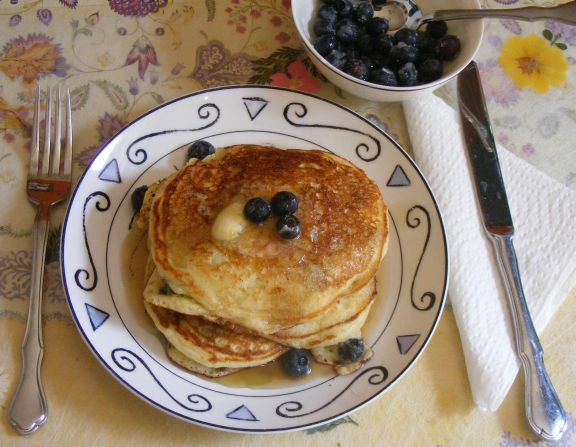 Sprinkle with sugared blueberries, about 2 tablespoons per pancake. Cook until edges are set, 3 to 4 minutes (bubbles won’t appear as with traditional pancakes). Flip, and cook until golden brown, about 2 minutes. Repeat with remaining batter and blueberries, adding more butter to griddle and keeping prepared pancakes warm on a baking sheet in the oven. Serve with orange maple butter and pure maple syrup. Using a rubber spatula, combine ingredients in a small bowl. Orange maple butter can be refrigerated in an airtight container for up to one week.